Entitled to ride on THSR trains an unlimited number of times for 3 days. Pass is valid within 30 days after the purchased date and must be utilised on 3 consecutive days after Day 1. Entitled to ride on THSR trains an unlimited number of times for any 3 days within the specified week. Pass for Day 1 is valid within 30 days after the purchased date. Day 2 and 3 are valid within 7 days after the Day 1. Perfect for travelers who want to savor the cultural sentiments of various townships in Taiwan. Entitled to ride Taiwan Railways trains Chu-Kuang class (inclusive) or lower an unlimited number of times. No reserved seat is available when riding in Taiwan Railways Chu-Kuang class and Fu-Hsing class. Pass for Day 1 is valid within 30 days after the purchased date. Railway ride must be utilized on 5 consecutive days (include Day 1) after Day 1. Taiwan HSR ride can be used in any 2 days within 5 days after Day 1. Perfect for travelers who want to travel around famous scenic spots in Taiwan all at once without leaving any regret. Entitled to ride Taiwan Raiways trains Tzu-Chiang class (inclusive) or lower an unlimited number of times. Entitled to ride on THSR trains for any two days. Pass is not valid for Taiwanese. Pass is valid for one pax and is non-transferable. Bring along the receipt to Taiwan High Speed Train Counter and enjoy your ride. 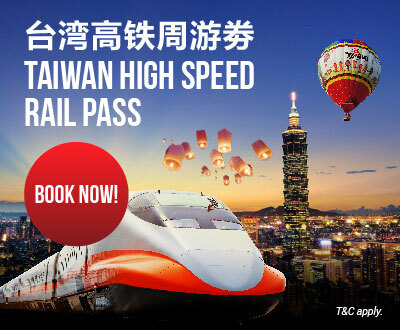 Book your train passes for Taiwan High Speed Rail with Easybook.com. It is perfect for frequent travelers and tourists. The prices of the passes are cheaper than counter price with unlimited rides between numbers of stations in Taiwan. The Taiwan High Speed Rail transfers passengers between some of the best scenic spots and stations such as Tainan, Banquio, Taoyuan, Taipei, Hsinchu, Taichung, Chiayi etc. Various passes are available as per convenience of the passengers such as 3 Day Pass, Flexible 3 Day Pass, 5 Day Standard Joint Pass & 5 Day Express Joint Pass with wide range of facilities & amenities. It is one of the best mode of transportation in Taiwan as these passes entitles the passengers to ride Taiwan High Speed Rail in Tzu-Class, Chu-Kuang Class, Fu-Hsing Class etc along with unlimited number of rides in lower class. These passes have been designed as per convenience of the customers as they can choose these as per their requirement. Various modes of the Taiwan High Speed Rail passes are offered such flexible or standard pass with number of interchanging station feasibility and unlimited rides. It is convenient for passengers living in Singapore and Malaysia as they can book their rides in local currency and enjoy the rail rides for number of days. Taiwan High Speed Rail boasts high speed linkage between its stations which has effectively helped the middle class to transport themselves from one place to another. The 8 stations namely Taipei, Banqiao, Taoyuan, Hsinchu, Taichung, Chiayi, Tainan and Zuoying Stations have served the needs of millions of passengers. Customers travelling frequently between these stations can save their money through these passes. Taiwan High Speed Rail passes are offered in different forms with exquisite class range and specified number of days. THSR Passes saves time and money as one can enroll their passes online without wasting any time at long queue. Taiwan High Speed Rail operates at a speed of around 293 km/hr with numerous trains each day. Passengers who have enrolled passes with Easybook have never regretted as they get to know various scenic spots in Taiwan. They savor diverse Cultural Townships of several places in Taiwan. Discounts are offered in various passes and they are reflected upon the price itself. These train rides offers smooth transfer between train stations with convenience of on board services. The passes are offered to customers are valid for one pax and seats are subject to availability. So, we should book passes as soon as available in order to enjoy the train rides with maximum benefits. Time is quite important for each of us. The Taiwan High Speed Rail passes ensures seamless transportation along with efficient time management. Booking passes online is one of the ideal forms of time management for office goers. It saves their precious time and helps them to travel conveniently. Instead of waiting in the long queues, one can book their respective passes through a click of their mouse or phone. People can plan way ahead of time and save precious moments during lunch & work hours. The flawless pass booking system at Easybook with enhanced features has helped hundreds of customers to their passes without any hurdles and complaints. Various Taiwan High Speed Rail Passes offered at Easybook such as 5 Day Standard Joint Pass has proved to be a boon for passengers as they can ride Taiwan High Speed Rail in Chu-Kuang Class and enjoy the scenic view through the window panes of the trains. The stations of Taiwan High Speed Rail such as Taipei, Banqiao, Taoyuan, Hsinchu, Taichung, Chiayi, Tainan and Zuoying offers vivid facilities as passengers can visit popular food stalls available inside the station and cherish delicious meals of Taiwan. Moreover, booking rail passes online is ideal for passengers travelling to Taiwan from other nations. As they can plan way ahead of their schedule by purchasing passes prior visiting Taiwan instead of waiting in the crowded queue for endless hours. The costs of the passes are offered competitively to passengers along with added benefits. Passengers travelling to Taiwan cherish the lobby and entrance hall of each station as they have been constructed meticulously to aid passengers with wide range of services. Customers cherish the free spaces available inside the station halls and platforms. These rail passes have significantly enhanced the mode of transportation for passengers as they could travel conveniently from one place to another. Passengers often cherish the themes of the station as they are designed with high tech engineering and innovation. It attracts tourists globally with enhanced features and technology. It is advisable that one should book their respective Taiwan High Speed Rail passes in order to avail utmost benefits. * A confirmation Pass Exchange Order will be sent to you within 3 to 5 working days after each purchase.